Be ready for anything, anywhere, anytime with this Deadpool tactical backpack. 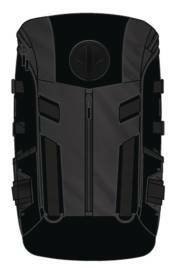 This black duty backpack from Marvel is made with durable canvas material and features an interior laptop sleeve, zipper closure, front zipper pocket multiple snap closure pockets, a buckle closure flap and utility straps. If you need to carry it, it will go on or in this backpack!